Luang Por Kasem was born on Wednesday, 28th November BE2455 in Jangwat Lampang. Luang Por Kasem was the descendants of Lampang's King from Lanna Period. 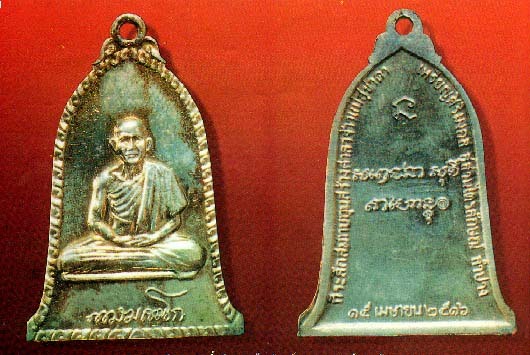 After he entered monkhood, Luang Por Kasem went to Jangwat Chiangrai to further his Pali studies. He met Luang Por Krubah Gaen, a very famous monk in North Thailand who was a Tudong monk (forest monk), very good in sammahdti. 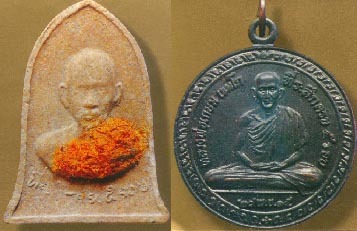 Luang Por Kasem became a disciple of Pra Krubah Gaen and went Tudong with his teacher in forests and cementries. When the abbot of Wat Bunyeun passed away, Pra Dtomkum became the new abbot. After some time, Pra Dtomkum left the temple and the post of abbot at Wat Bunyeun because of boredom. The villagers invited Luang Por Kasem to return to Lampang to be the new abbot of Wat Bunyeun. Luang Por Kasem continue his learning in dhamma and sammahdti practise even when he was the abbot. The more he trained, the more realised that life is uncertain. His duties as the abbot, kept him rather busy and finally in BE2492, he left Wat Bunyeun, and went to stay at Sasahn Sahlahwangthan (a cementry at another place in Lampang). Luang Por Kasem was determined to practise the highest sammahdti at the cementry. He would sit in front of the burial place and watch the burning of corpse. Whether in hot sun or raining, Luang Por would just sit quietly and watched the corpse being burned to ashes. Luang Por Kasem ever sat in sammahdti for as long as 3 months, without shether under hot sun or heavy rain. Even his robes were wet by the rain or during cold season, when the cold wind blows, Luang Por Kasem would just sit quietly and not complain and asked for anything. He had let go of everything and steadfast in his practise of dhamma and sammahdti. He ever go without food for 49 days. Since BE2514, Luang Por Kasem only bathed once a year, but there is no stench or foul odour from his body, even his sweat was pouring under the hot sun. More surprisingly, without shether and mosquito net, Luang Por Kasem never suffered a bite from mosquito at the cementry. Luang Por Kasem carried nothing with him. His only possession was an alm bowl, his robe which he was wearing and a piece of human bone for him to practise sammahdti. He did not even have any footwear. Luang Por Kasem ever mentioned that he is a forest monk and does not required any possession. He was contented with a piece of robe covering his body. Whatever things that the layman gave to him, Luang Por Kasem would give away to other monks. Luang Por Kasem never used a pillow to sleep, because to him, a pillow is a luxury. Luang Por Kasem would sleep with his body in full protrate position and would sleep at the same spot where he sat in sammahdti. He was very determined to find the truth of life. He asked for nothing in life though he can enjoy the luxuries in life as he was the descendants of royal blood in Lampang. Luang Por Kasem passed away in BE2538 at the age of 83.